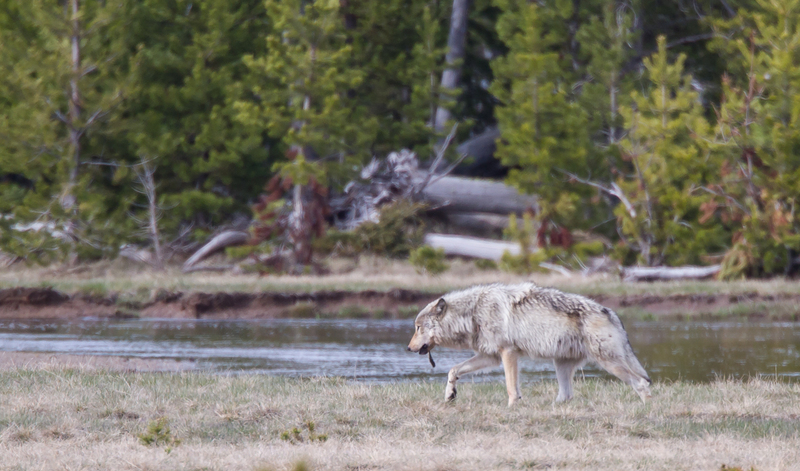 It was clear to me in an instant why nearly 100,000 people say they come to Yellowstone each year just to see wolves. I have been going to Yellowstone since the early 1980’s, a decade before wolves were reintroduced. In my early trips, it often seemed like I had the northern range (areas like Little America and Lamar Valley) to myself. There were no major tourist attractions on the road out to the northeast entrance – no geysers, no canyons, no lodges or restaurants. Some days it seemed it was just the wildlife and me. 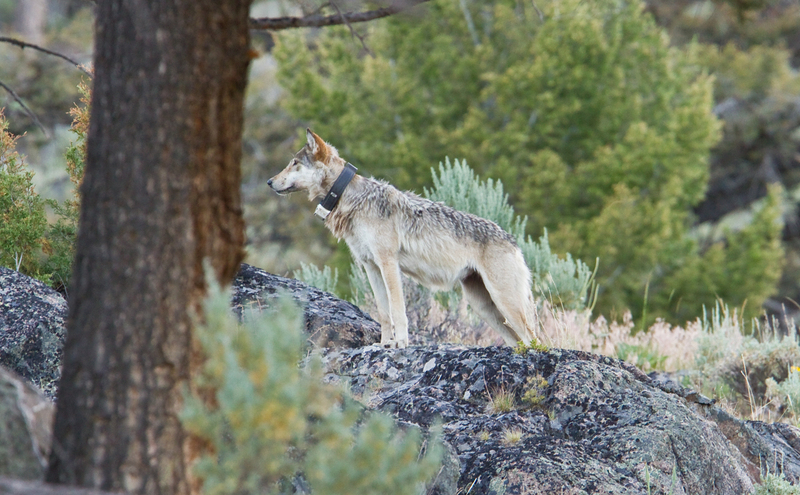 After Gray Wolves were reintroduced to Yellowstone in 1995, visitors suddenly “discovered” that part of the park as it was, and probably still is, the best place in the park (maybe even the world), to observe wolves in the wild. I always feel a bit of pressure to make sure my clients see a Gray Wolf, and this trip was no different. The first couple of days with them were wolf-less. Luckily, the abundance of Grizzly Bear sightings took some of that pressure off. Then, on our first trip through Lamar Valley, in dwindling light, a black wolf crossed the road in front of us and gave our group a great view as it moved off across the sagebrush flats near the river. Over the next couple of days in the northern range, we saw a distant wolf on an elk carcass and watched as a large Black Bear claimed the prize without incident, and saw two wolves feeding at a Bison carcass far across the river in Lamar. On the group’s last morning, we witnessed some amazing interactions at that same carcass. When we first arrived there were two wolves just leaving the carcass, and they were being herded by a group of several Bison that seemed none too pleased that these predators were dining on one of their own. 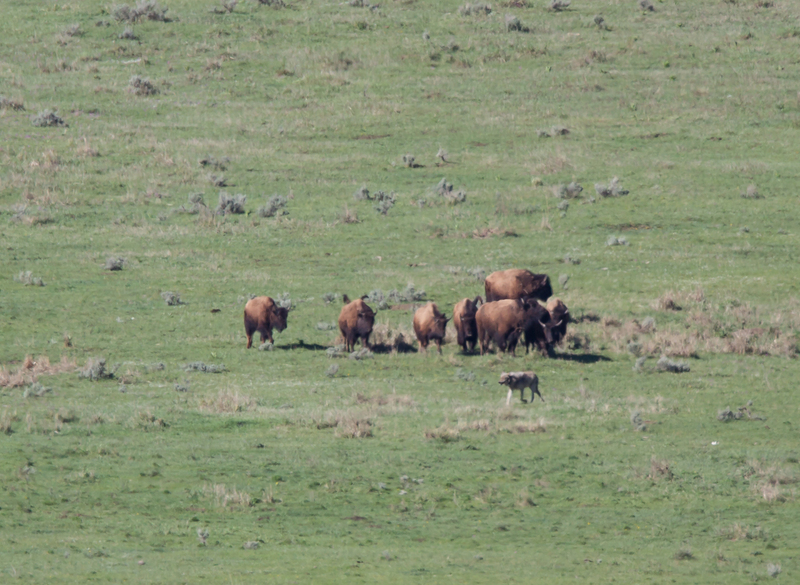 The Bison eventually pushed the wolves away and convinced them today was not a good day to continue feeding. Meanwhile, a Grizzly came down out of the woods and eventually claimed the carcass, in spite of being initially held off by the same agitated Bison. Quite a Lamar farewell for my group – a Grizzly Bear, two Gray Wolves, and a protective herd of Bison interacting in the same field of view of our binoculars. So, even though the group did witness some excellent wolf behavior, I still felt a tad guilty about what they had missed in my first two days in the park before they arrived. 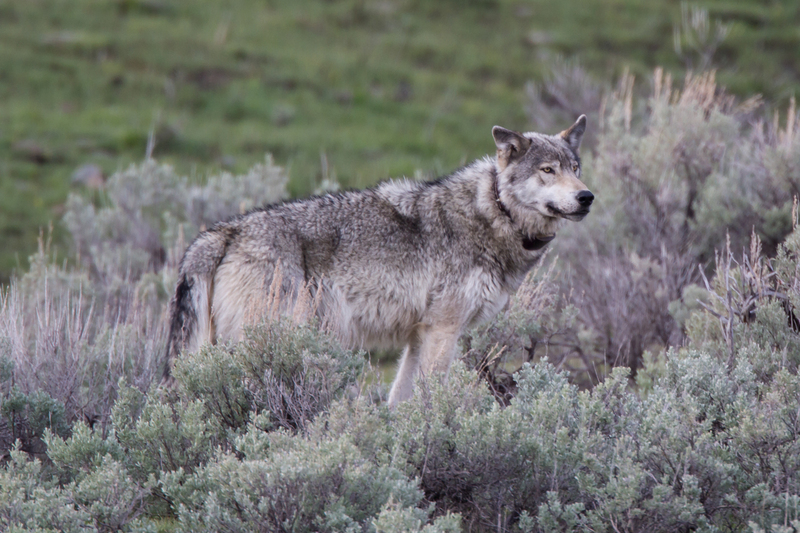 On the second evening, while parked in Lamar Valley, looking at a carcass of a roadkill Mule Deer that had been feeding various scavengers all day, I glanced out in front of the car and saw a wolf headed toward me. It was one of those rare moments when there is almost no one else around and a wolf suddenly shows itself. 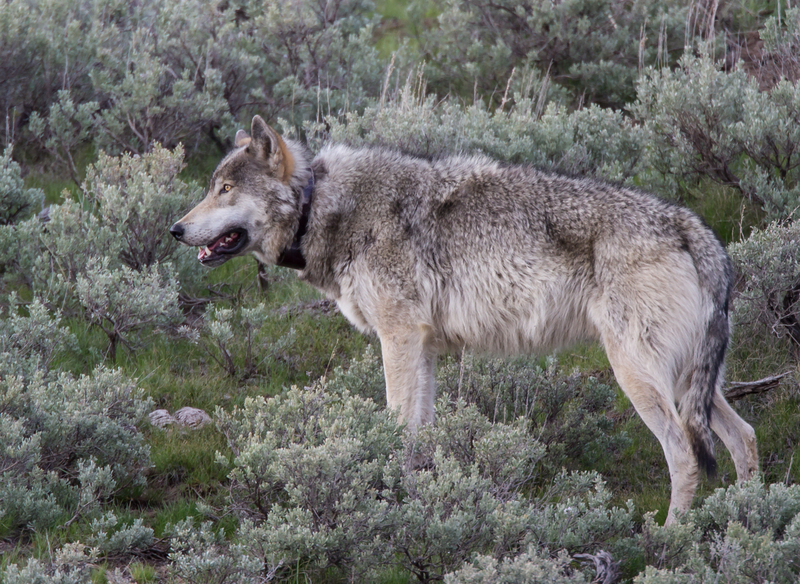 It quickly became apparent this was the alpha male of the much diminished Lamar Canyon pack, a wolf known to researchers as 925M. This pack now has only two adult wolves and an unknown (as yet) number of pups. 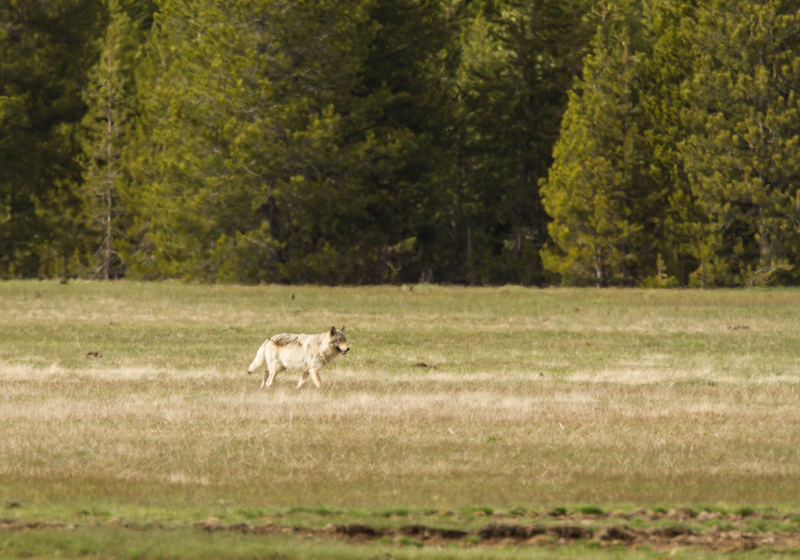 It was in June two years ago, when I was with another group, that we were thrilled by the presence of what is probably one of the most famous wolves in the history of Yellowstone, a wolf known simply as 06. She was then the formidable alpha female of the Lamar Canyon pack, whose territory encompassed much of the prime wildlife habitat of Lamar Valley in the northeastern portion of the park. In December of 2012, she was legally killed by a hunter about 15 miles outside of the park boundary. After the de-listing of Gray Wolves from protection under the Endangered Species Act, states adjacent to the park opened hunting seasons. As with other wildlife, wolves do not recognize park boundaries, and on one of her packs’ forays just outside the boundary, 06 was killed. Another collared male of the pack was also killed that same hunting season. The end result was the disruption of the pack (the alpha male was the father of the remaining pack females and thus he left to start another pack). The current alpha female of the Lamar Canyon pack is the daughter of 06. The alpha male is easily recognizable as he is a large, collared male wolf and he has a floppy right ear. After crossing the road near me, he marked his territory, and then paused and glanced around at the few cars that were starting to gather. Although brief, it was an incredible encounter with a beautiful wolf. It will be challenging for a pack with only two wolves to raise their pups and defend their territory. But, reading Yellowstone Reports since my return shows that they have been successful thus far, with recent kills of a Mule Deer and an Elk. It will be interesting to follow this pair over the next year. 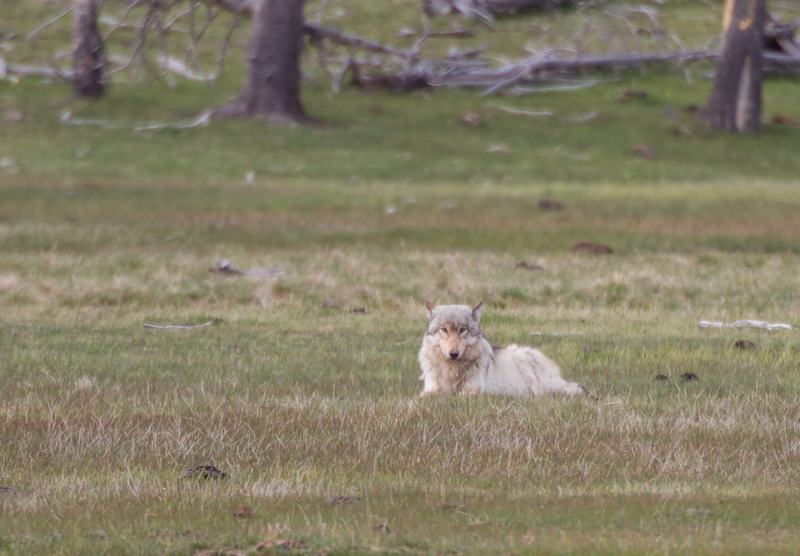 As if the encounter with 925M wasn’t enough, there was yet another wolf sighting the day before my group arrived. Coming through Gibbon Meadows, I saw a group of cars stopped and pulled over to catch a glimpse of a very light-colored wolf (probably a member of the Canyon pack) before it disappeared into the trees. The pack had killed an Elk and was coming and going to the carcass, which was hidden in the trees near the pullout. Later that same day, I returned to the site and waited. There were three Bald Eagles and some Ravens on the carcass, but no wolves. Just about when many in the crowd (including me) seemed to be getting ready to head out, the light wolf trotted out of the woods and headed our way. The wolf went directly to the carcass and was seen pulling and tugging at the meat. After several minutes, the wolf walked out of the trees, carrying a piece of the carcass under the watchful eyes of some Ravens. The wolf walked out in the meadow and used its nose to scrape a shallow hole. It dropped the piece of meat into the hole. 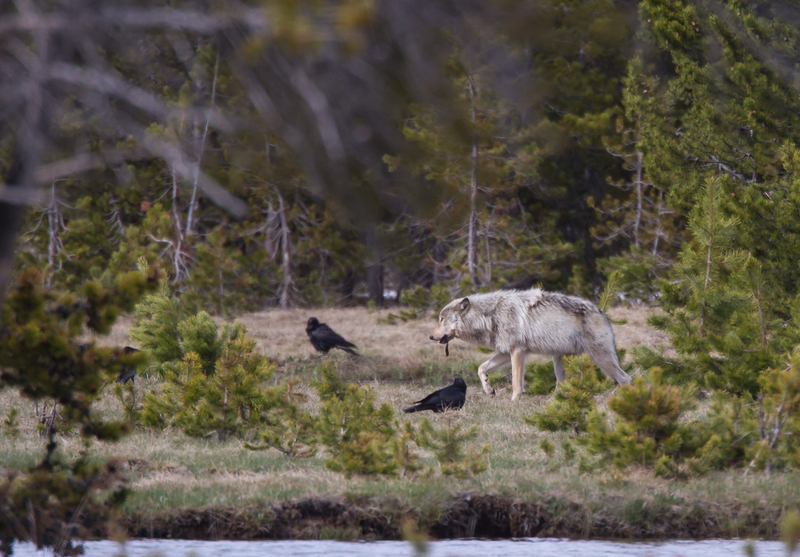 I heard several comments echoing my thoughts….as soon as that wolf walks away, those Ravens will be all over that meat. We should have given the wolf more credit….it walked a few feet away and then laid down next to its cache of food. After staring at us for a few moments, it laid flat for a good, long nap, but probably still had one eye open in case the Ravens got too close. 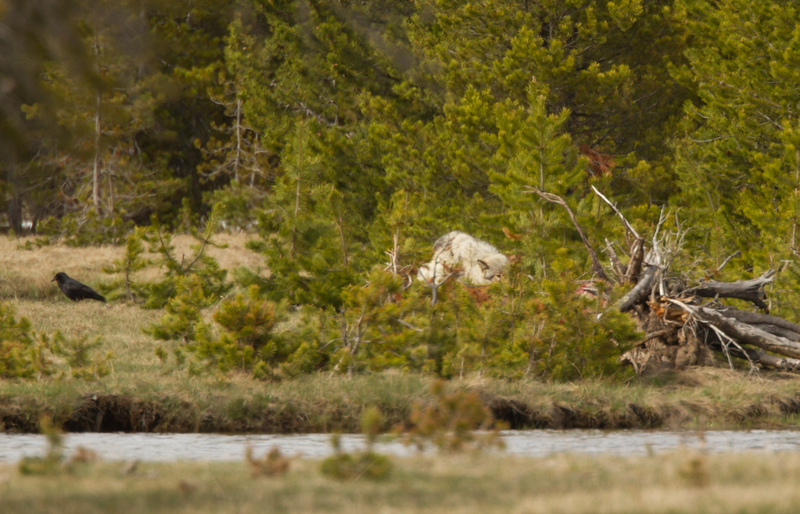 After watching it for another 15 minutes or so, I decided to head north for the afternoon, feeling lucky to have seen another chapter in the life of a Yellowstone wolf. 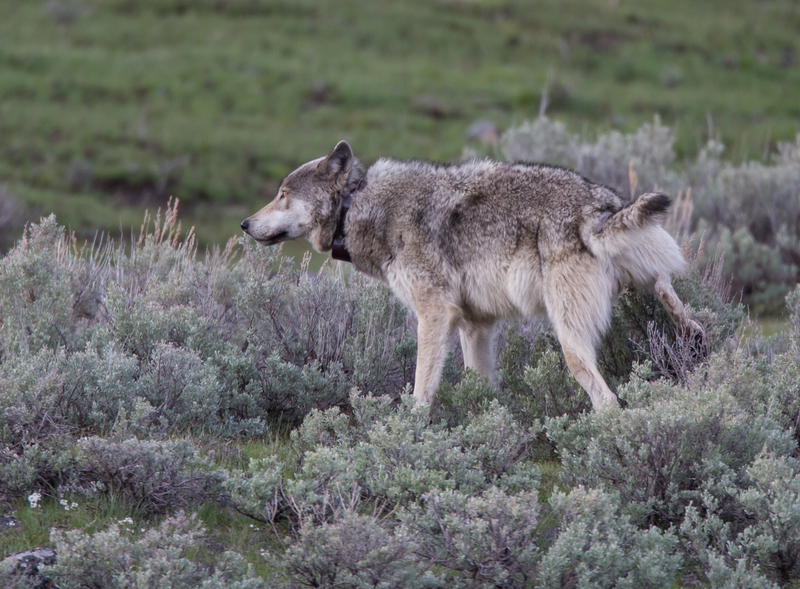 This entry was posted in Natural History, Trip report and tagged gray wolf, lamar canyon pack, Yellowstone by roadsendnaturalist. Bookmark the permalink. 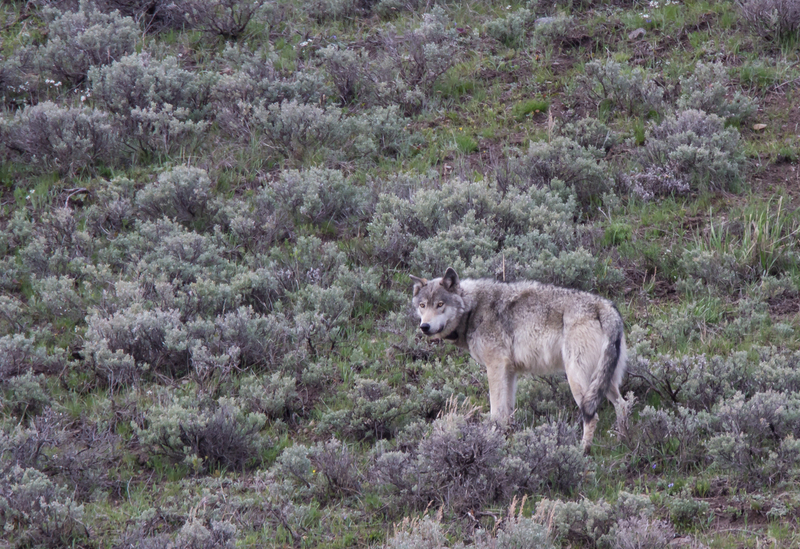 I think you are correct, and I think it was probably a young wolf (yearling from the Junction Butte pack). Mike, I like how you make it feel like the reader is there.